The exterior of the mechanical building at Seaway Transit Center will feature masonry and glass block windows. About 1.7 of the 2 acres of concrete needed for the future transit center has been poured, creating bus lanes and platforms. Curbs and sidewalks will be the poured the week of June 4. The exterior of the mechanical building should be complete by the end of the day June 1. This includes the roof, masonry and glass block windows. Bus shelters, wayfinding signs and landscaping will be installed over the summer. The right lane of northbound Seaway Blvd. will be closed from 8:30 a.m. to 2 p.m. on Tuesday, June 5 to pave the curb of the new bus pullout. The right lane of eastbound 75th St. will be closed June 6-7 from 8:30 a.m. to 2 p.m. to continue installing vehicle detectors at the intersection of 75th St. and the Seaway Transit Center entrance. Ticket vending machines at every Swift Blue Line station have been successfully upgraded with new software that allows up to five tickets to be purchased at once. Transactions on the new software are a little different than on the old machines; the biggest difference is that payment is made at the end of the transaction, not the beginning. If you need assistance, this video demonstrating the new process shows how it's done. Swift Blue Line stations have been in operation since 2009, and they are ready for a fresh coat of paint! The stations will be power washed during the week of June 4 to prepare for painting. Power washing will be done during non-service hours and will not affect traffic. Beginning June 11, painting crews will close two stations at a time to repaint them with a specially formulated high-performance paint. 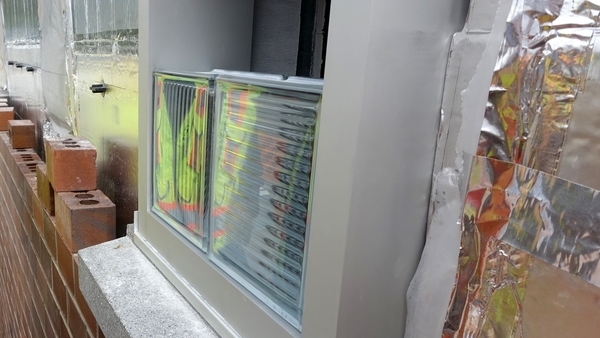 While painting, the entire station will be enclosed so the work can be done quickly and in an environmentally safe manner. The photo at right shows the Swift training station enclosed during the painting process. Pedestrians will be able to access the sidewalk on the street side of the station, and Swift buses will pick up and drop off passengers at the nearest local bus stop. 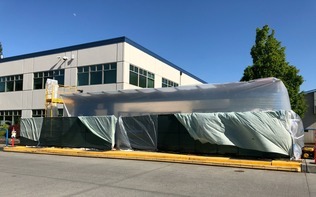 ORCA readers and ticket vending machines will not be operable at a closed station; riders are expected to pay their fare when they get off of the Swift bus. Notice will be posted at each station a week before it closes and will include directions to the nearest local stop. What is the Swift Blue Line? 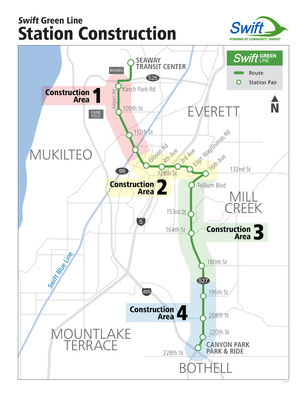 Click here to see how the Swift Blue Line and the Swift Green Line will connect. 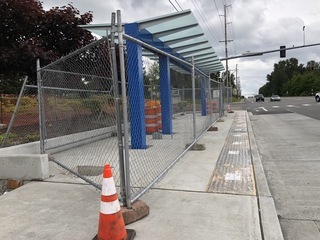 The Swift Blue Line provides bus rapid transit service on Highway 99, serving 29 stations between its terminals at Everett Station and Aurora Village Transit Center. The Blue Line has been in operation since 2009. Information about Swift Blue Line is online at www.communitytransit.org/swiftblue. Crews are nearly finished installing a new traffic signal near the northbound I-5 on-ramp on westbound 128th St. On Sunday, June 3, one westbound lane of traffic near the on-ramp will be closed from 8 p.m. to 4 a.m. while the new traffic signal is completed and tested before the old one is removed. Throughout next week, crews will continue work on driveways and sidewalks in front of the Quality Inn hotel and the Shell gas station, as well as on the traffic island at the I-5 on-ramp. Traffic will be routed to one side of the island or the other as needed, but no lane closures are expected. Next week, crews will power up the new traffic signal just before the I-5 overpass and remove the old one. On Thursday, June 7, one eastbound lane of traffic will close at 8 p.m. A second lane of traffic may close intermittently, but southbound on-ramp to I-5 will remain open at all times. All lanes will re-open by 4 a.m. on Friday morning. 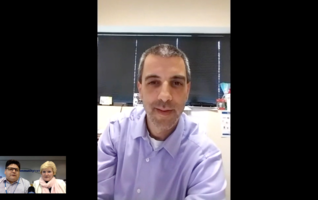 The May 29 Community Transit Live webcast featured construction updates and a special guest -- Matt Coomes, live from the RideStore at Lynnwood Transit Center. As supervisor of the RideStore, Coomes handles many customer service issues, including Community Transit's Lost and Found items. Watch the 30-minute video to get the latest information on Swift Green Line construction and to hear funny stories about the things that people leave behind on buses! Keep an eye on Swift Network News for the date of the June edition of Community Transit Live. Many station sites in Area 1 have completed the first several phases of construction, with steel frames and glass tops in place. These stations are fenced off for safety (see photo) while they await the next phase of construction this summer. Westbound, 132nd St. and Elgin Way/Dumas Rd. Westbound, 132nd St. and 16th Ave. Concrete will be poured for foundations, platforms, ramps and curbs. The work requires one right-hand lane to be closed but will be staggered throughout the week, with crews at each site for 1-2 days. Concrete platforms will be poured one day next week at the northbound station site at Trillium Blvd. This will require one lane to be closed from 9 a.m. to 2 p.m.
At the northbound 164th St. station, nighttime crews will continue storm drain work from 8 p.m. to 4 a.m. several nights next week. Finally, the road widening project just south of 164th St. continues next week with nighttime (8 p.m. to 4 a.m.) excavation work early in the week followed by daytime (9 a.m. to 2 p.m.) foundation work and concrete pouring. This project will widen the right lane from 150 feet to 800 feet. When complete, general traffic will be required to turn right from this lane onto Mill Creek Rd., but buses will be allowed to proceed northbound.